Nepenthes lowii X aristolochioides is a cross between two highlanders. Exotica Plants has produced some jaw-dropping hybrids with N. aristolochioides. 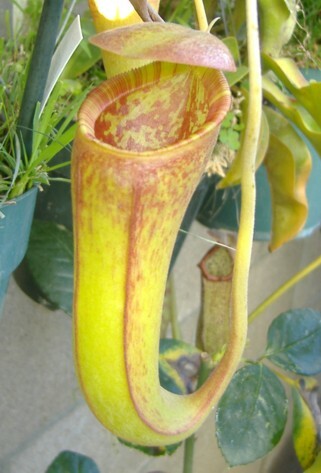 I was able to get this plant from one of EP's auctions with Dean from Cook's Carnivorous Plants. I've been growing it in full sun with no problems. EP's website has a few nice photos of their hybrids too. I've found that so far it is easy to care for and acts like a typical highlander. It may grow slightly faster now that it is a larger plant and out of the rosette stage. My N. aristo's are fairly quick growing for highlanders so that may help with this hybrid because N. lowii sure does take its time growing. I haven't seen any other plants available of this hybrid anywhere. There seems to be very little information at this time as well. Why there aren't more around is a bit of a mystery to me. It may be possible that EP is waiting for their plants to mature more before release or that there were limited numbers of this hybrid produced. I guess time will tell.